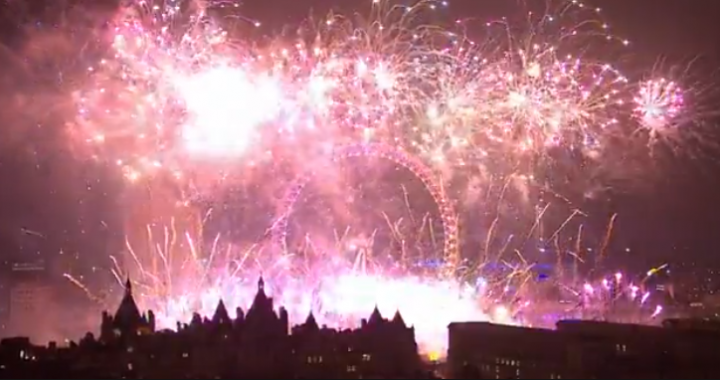 Happy New Year 2015 (in London). Feng Shui Rituals for the New Year. Good Luck Feng Shui Rituals. At midnight, people switch on every light in their home, believing that this will clear any bad spirits from all corners of the house. They also open every cupboard, door and window – then run around closing them up again.At midnight, people switch on every light in their home, believing that this will clear any bad spirits from all corners of the house. They also open every cupboard, door and window – then run around closing them up again. For each of the 12 chimes at midnight, every Spaniard must eat one grape. This will provide prosperity for the rest of the year. On New Year’s Eve, Venezuelans wear yellow underclothes for good luck. People buy pomegranates and throw them from their balconies. The more they can throw, the more prosperous year they will have. At midnight, they crack an egg into a glass and leave it on the windowsill for the night. In the morning they inspect how it looks. What it looks like will represent and predict what kind of a year they will have? At 00:00, people go outdoors banging pots and pans very loudly. At midnight, people fill containers with water – then throw the water outside of their front doors. On New Year’s Eve, Dutch people eat ‘oliebollen’ – a donut-like pastry which is deep fried and covered in sugar. Write down your wishes for the new year, burn it, put the ashes into a glass of champagne and drink it before 00:01. After the midnight, the tradition of the “first guest” starts, i.e. it’s good to be the first quest in the new year at somebody’s home. People visit each other bringing gifts such as bread, salt, whiskey, etc – wishing the visiting families happiness and prosperity. Eat a spoon of lentils in order to have a prosperous year with plenty of work. Also, sweep your home from inside out – to get rid of any bad vibes. Take en empty language and circle your home a few times – to ensure lots of travel in the new year. The question is in which direction to circle: clockwise or anticlockwise? The answer is: if you’re in the southern hemisphere anticlockwise, if in the northern hemisphere: clockwise. In order to attract new love, ladies wear pink knickers and men red underwear. At 24:00 everyone outstretch their right foot – to start the new year well. 1) Wear white clothes to ward off bad spirits. 2) Jump over seven waves to ensure happiness for every day of the week. 3) Offer gifts to IEMANJA, the goddess of water. She likes gifts, especially flowers. Throw them into the ocean but if they come back – it means that she didn’t accept them. In China, number eight is considered lucky because the word for “eight” (八 Pinyin: bā) sounds similar to the word which means “prosper” or “wealth” (發 – short for “發財”, Pinyin: fā). Print the Chinese character for wealth and place it in your wallet. Posted in Good Luck Rituals for the New Year.